Below are a list of my favorite flowers from each season. Spring. 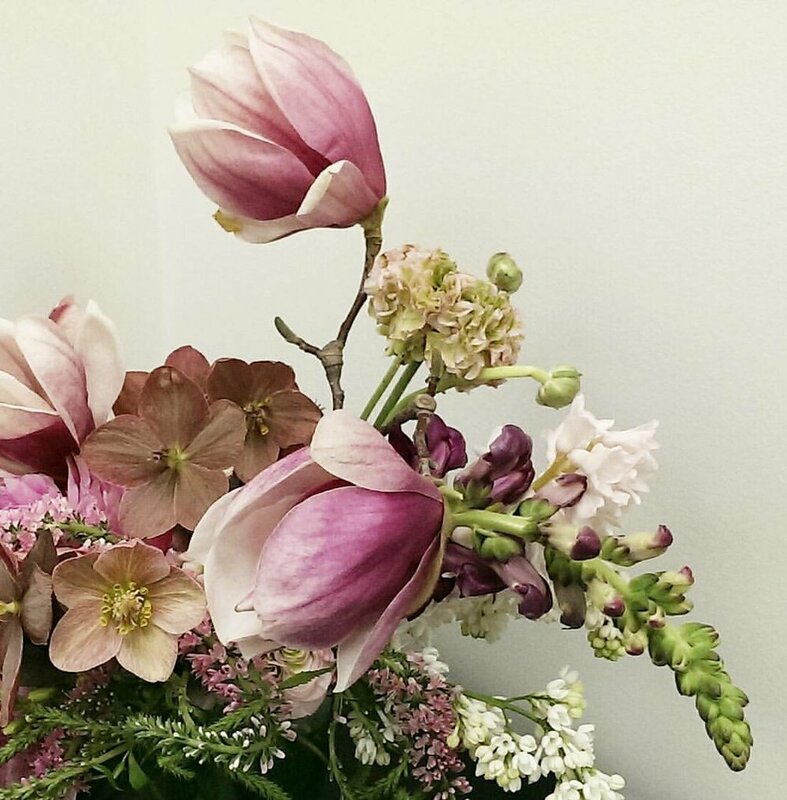 Local anemones, ranunculus and sweet peas from Lynnvale Studio, a flower farm in Gainesville, Virginia. Andrea, the owner, has colors unique to the market and her sweet pea stems are long and sturdy. She works the Dupont Circle and Palisades Farmers Markets on Sundays. Another favorite - blueberry branches and mint foliage! I source them from Greenstone Fields, a flower farm in Wheatland, VA. They work the Falls Church (VA) Farmers Market on Saturdays. Fall. Local dahlias, basil and tuberose. I always love buying local dahlias and tuberoses, the wholesale version pale in comparison to buying them fresh (literally cut the night before) from a local flower farmer. My favorite scent is tuberose and basil mixed with garden roses which I can only get in September. Lynnvale Studios and Greenstone Fields as well as Wollam Gardens. They work the Dupont Circle market on Sundays) and Don's Dahlias have an amazing selection of dahlias starting in August through October. Spring to Fall. 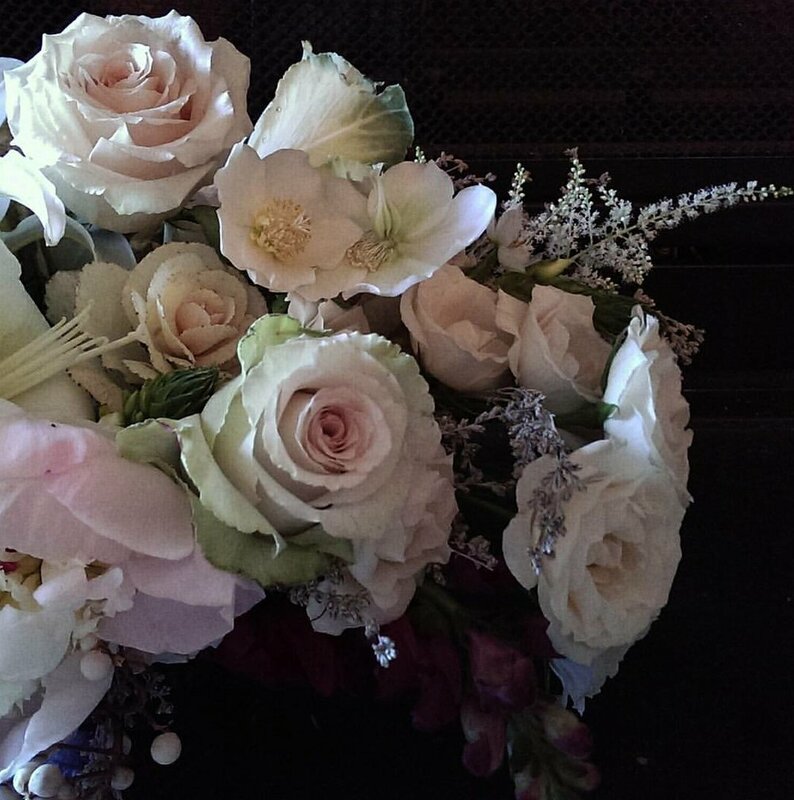 Garden roses from Rose Story Farm in California. They grow heirloom garden roses and some are not as big as David Austin garden roses, but when grouped together they make such a gorgeous, visual impact. Winter. Hellebores, pieris, white kale, and evergreens (Carolina Sapphire is a favorite). And kumquats! This is even more emphasized in traditional ikebana flower arranging which is a style flower arranging originating from Japan. Minimalist, simple, and asymmetrical are three words that describe this type of arrangement. Design lines are especially important with flower and foliage stems placed in different vertical and horizontal angles. In traditional floral arranging classes, ikebana is typically taught first as the elements of design are especially important in this type of design work. Traditional ikebana flower arranging takes years to master, there are even schools to receive certification to ultimately become a master. Try to maintain sufficient yet harmonious space between the flowers, leaves and stems. Imagine a vertical line in the middle of the container, around which you will arrange the elements in varying heights and angles. Select one or three larger flowers to be the focal point. Examples are lilies or chrysanthemum shaped flowers. *A natural balance is achieved when you use odd number flowers. Branches (flowering or bare) in vertical and horizontal angles are a common element and add the right balance between height and length. Thin stems and branches require large fillers. Smaller blossoms go well with thicker leaves. Showy blossoms can look good on their own. Right now I am experimenting with combining ikebana style or inspired elements with garden style elements which is more full and organic, usually keeping in mind vertical and horizontal angles and sometimes making use of flowering branches as part of the design work. My ikebana-style arrangement of late have been more lush than a normal a typical ikebana style arrangement. I hope to master this flower arranging style one day and teach other people how to do it! Ranunculus start appearing at market November/December, are at their best in January, with their main season usually coming to an end in May/June. I look for flower heads that are somewhat closed. If I want them to open more, I will keep them out at room temperature. When I get home, I keep the wrapping on, lift the wrapping from the bottom and remove most of the foliage, clean the stems and make a new cut at the bottom of the stems. Then, I place in a sterilized bucket or vase of luke warm water with flower food and keep cool for a few hours prior to use. The reason I keep the wrapping on (and place upright in the bucket or vase) is because ranunuculus like tulips are phototrophic meaning they will bend towards a light source. I also keep the wrapping on also to help keep the flower heads closed until I am ready to use. Ranunculus can last more than a week (I can make mine last three weeks, even a month) with proper care (changing the water every few days, keeping cool in the evening when not in use). Their stems are hollow so what I do to add extra support is make a small loop at one end of a 26 gauge wire and run the wire through the opposite end first through the center of the flower head, guiding the wire through the stem until the part of the wire with the small loop is inserted in the middle of the flower head. Then I wrap stem tape around the top portion starting from the bottom of the head to 1/4 way down the stem. Florists use the standard size variety but also a variety called 'Cloni' which are much larger than the standard variety, some larger than roses. When fully opened they resemble garden roses or peonies. This variety is called 'Cloni' because the grower or breeder has taken the largest bloom from a standard ranunculus plant and clones that bloom so that the next generation of blooms are larger blooms. This variety is not available in the grocery store. You can purchase from your local florist, just call ahead of time in case they need to order. Clonis are available year round. With any cut flowers especially if you are cutting straight from your garden, you will want to condition, letting the flowers "rest" before using. Basically making sure you clean the stems, making a fresh cut at the bottom of the stems and removing foliage that will hit the water line and keep cool submerged in water with flower food before using. Think about it. When we're out and about especially when it's warmer, we're tired/thirsty/hungry when we get home. Same with goes with cut flowers, they need to "rest" before you actually use them so that they will look fresh and not droopy. Delphinium and stock are what designers call line flowers. Line flowers are tall and give your flower arrangement or bouquet height, width and a balanced look and can also add movement to your arrangement. Most line flowers have buds growing up a center stalk. Most people have seen blue delphiniums in different shades of blue, but they also come in white, pink and purple. There is a newer variety called 'Black Eyed Angels' that are white with a black center and have semidouble blooms.. Stock comes in colors like white, pale yellow, pink and fuchsia. Line flowers like delphinium and stock can look striking on their own when placed in a tall, cylinder vase. Sometimes if I am using either delphinium or stock, I will buy bunches of either flower type in different shades of the same color to create an ombre color effect. With line flowers you will want to cut the stems about twice the height of the vase, leaving several stems an inch or two longer for the center of the arrangement. Crisscrossing the stems as you insert the vase will create a support system as you place the other stems in the vase and will help hold the stems in place. Start at the rim and work your way towards the center, adding other flowers and spacing as if they were points on a triangle. Place the longest stems in the center of the arrangement. Stand back and look at the arrangement, making adjustments as-needed. If you are using this arrangement in a small space in a warm room, I wouldn't use stock especially if you have guests who are sensitive to different types of scent. Stock has a heavy scent which is even more pronounced in a small, warm room. Flowers can be arranged in almost anything. Be creative. Not only can you use glass vases and ceramic vases, but you can also use items like tea cups and vintage bottles. Cans and jars are great for informal everyday arrangements. Low, wide vessels are great for low arrangements like table centerpieces. Bud vases look great with ranunculus. Sometimes I like to group stems of either the same flower or different flowers of the same shade in glass bottles. As with any vessel or vase, make sure you clean very well prior to each use. One of my favorite sources for vases and vessels is Jamali Garden. I have also used random bowls and vessels not necessarily made for flowers from Target especially their Threshold collection. 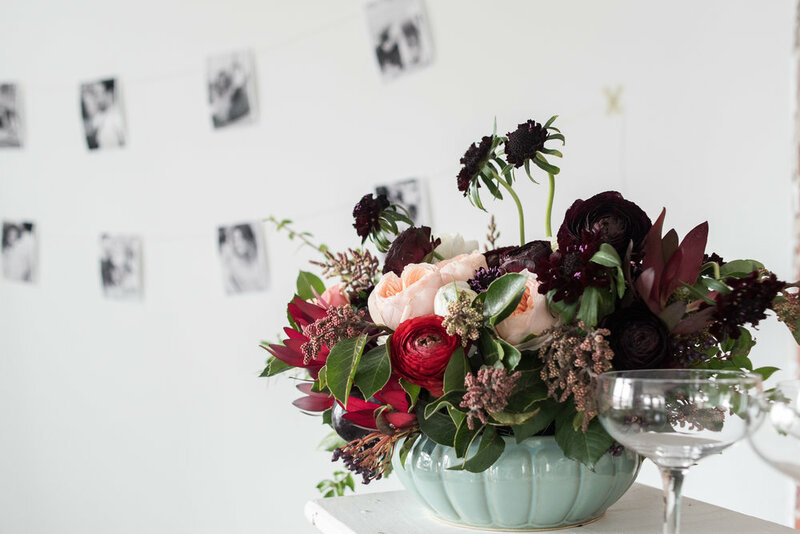 Flowers are great for dinner parties but keep in mind not only the way the flowers smell, but also the height of the vase and also the height of the flowers in the vase. I have been to a few dinner parties where I sat down and could not see the person I had been talking to all night because the gorgeous flower arrangements were too tall and blocking my view! I would go with a low, somewhat long vessel to go on the dining table. Local flower farms. 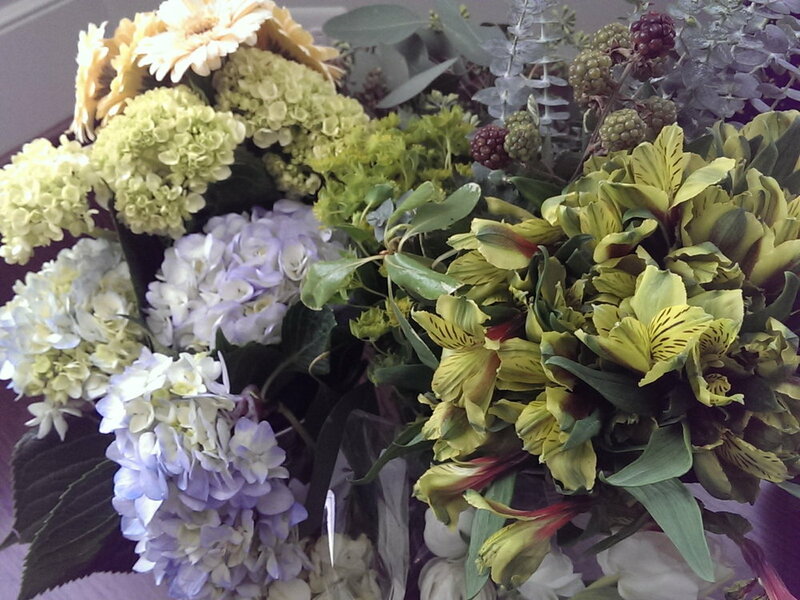 Whenever I tell people I buy some of my flowers from local flower farms, they look surprised. I guess people don't think of flowers actually grow on farms. I try to source locally first from local flower farms. The Association for Cut Flower Growers has a website that is a great source to find a local flower farm close to you. If you can locate a wholesale flower warehouse in your area, they are another source (and usually they will have a section for all locally grown flowers). Be aware though that most places require an account to be set-up and only sell at the wholesale level. A few places will sell at retail and some places will take cash. Grocery store flowers. Grocery stores have come a long way and have a great selection of flowers compared to ten years ago. 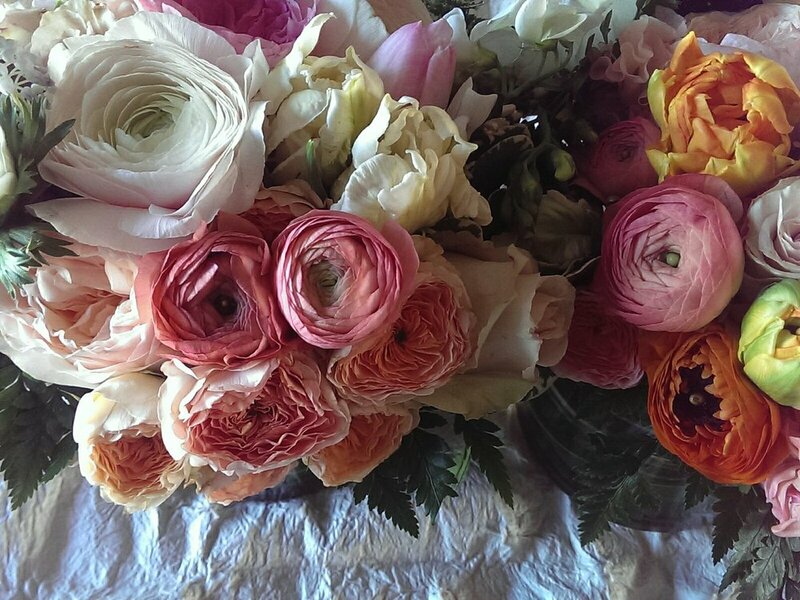 Whole Foods carries certain types of garden roses, freesia and even carry flowers from some local flower farms. Trader Joe's is another great source for flowers. I found cut cymbidium orchids there a few times! I like using green alstromeria as greenery even though it is a flower. It's a nice transitional flower that ties the vessel to the other flowers. Sometimes I incorporate Asian fruit such as longan branches into my work. See my comment on grocery store flowers here in this interview. Foraging. Foraging for flowers and foliage has become popular within the past few years. 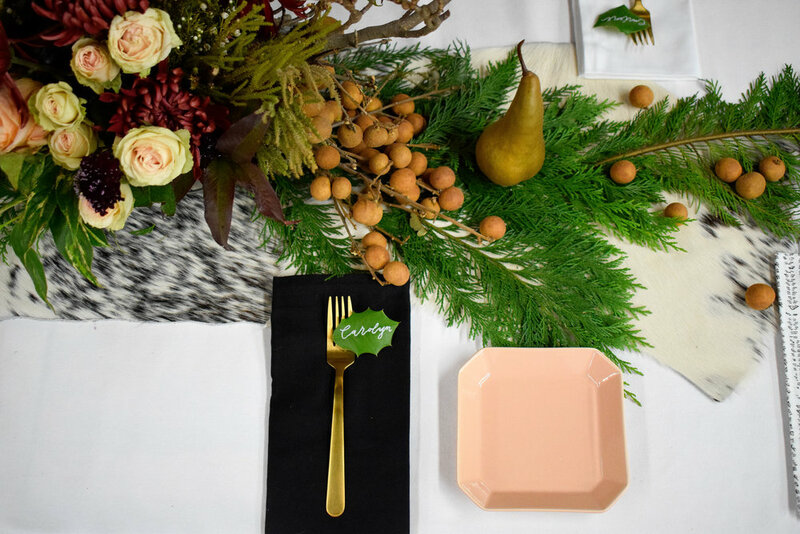 If you are going to forage for flowers and plan to use for a dinner party or event, make sure you test the flowers and foliage first prior and also make sure you clean and condition properly. I had a DIY bride tell me she foraged for foliage and florals for her wedding centerpieces and had ants all over the tables. One time I went to a dinner party and the hostess decided to cut Bradford Pear branches AND frittilaria to place in a vase on her dinner table. It was the most horrid smell ever especially since the dining room was somewhat small and the room was a bit warm. Also be wary about how different flowers and foliage react to the body. The euphorbia plant when cut releases a white sap similar to latex which can be an irritant to the eyes and skin. Some people have gone to the emergency room. My own experience with a variant of euphorbia called snow-on-the-mountain that I was handling at the farmers market. My wrist barely touched the foliage and brushed against the plant. I immediately started feeling a burning sensation on my wrist and my hand started to ache. 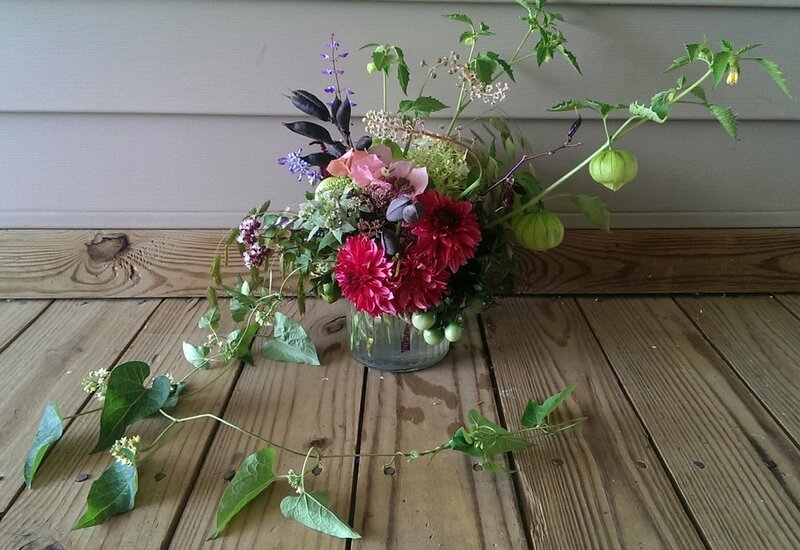 I like using vegetable vines and fruit branches in the summertime and fall. Below I used unripe tomato vine as well as passion flower vine.